A great poster found in Ireland recently. For every boy who is burdened with the constant expectation of knowing everything, there is a girl tired of people not trusting her intelligence. For every girl who is tired of being called over-sensitive, there is a boy who fears to be gentle, to weep. For every girl who throws out her e-z bake oven, there is a boy who wishes to find one. 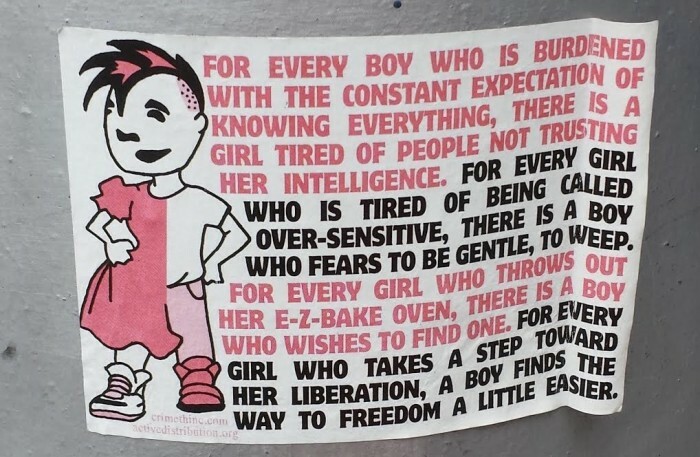 For every girl who takes a step toward her liberation, a boy finds the way to freedom a little easier.